An important part of green and sustainable construction is to minimize disturbance to the site and the environment. This includes minimizing the amount of construction waste produced as well as respecting the land around the building site. Prefabricated products such as Superior Walls make great sense in building green. They are manufactured off-site under strict quality assurance guidelines. When manufactured with materials acceptable as sustainable, green and local, it’s hard to envision a better method to be utilized when building green. Superior Walls’ Xi™ wall uses built-in 2.5 inches of Dow® STYROFOAM™ blue-board insulation. Everything about this wall is insulated, including corners, studs and top bond beam, making a complete thermal envelope. Special engineering makes the wall thermally insulated and isolated from the exterior elements. It is monolithically poured (poured all at once) with high-strength concrete for solid structural integrity and reinforced with steel rebar and polypropylene fibers. The Xi Wall’s special high strength, low-water concrete mix also requires no additional damp proofing, and meets or exceeds energy conservation requirements from both the IECC and the IRC Codes. Superior Walls concrete wall panels minimize the potential for energy leakage. The combination of pre-engineered built-in insulation and high-strength concrete makes a great foundation for energy conservation. Built-in insulation lowers energy loss through the basement walls. The R-12.5 insulation throughout the wall panels minimizes thermal transfer. The foundation panels are engineered and manufactured with insulated concrete studs, thus reducing the amount of lumber, stone, sand and concrete in your new home. Superior Walls 5000+ psi concrete, engineered with a lower water-to-cement ratio, ensures durability and helps prevent the transfer of moisture through the wall. A dry basement will limit the possibility of mold and other airborne fungi found in other basements which can affect your air quality. Superior Walls are built in an indoor production facility; therefore, no form oil is used at the jobsite. Because damp-proofing is built-in (ESR-1662), there is no need to use on-site bituminous coating. With the reduction of installation time, there is less environmental impact and less jobsite waste than a home using other foundations. Superior Walls is a manufacturer of NGBS Green Certified products. 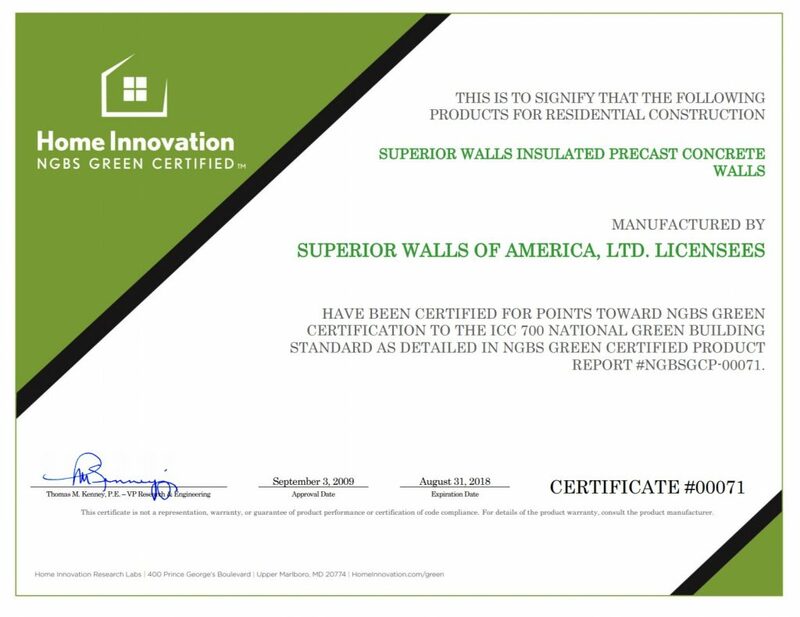 Effective on February 12, 2013, Superior Walls Insulated Precast Concrete Wall products are pre-qualified to earn specific green points as Green Certified Products by Home Innovation Research Labs (formerly the NAHB Research Center). The products can earn points in categories for resource efficiency, energy efficiency and indoor environmental air quality.This highly recognized certification program is offered by Home Innovation Research Labs. As shown in the table below, points can be awarded in several different categories called “practices” as outlined in the National Green Building Standard. The ICC 700-2008 National Green Building Standard was first published in January 29, 2009. You may purchase a copy at www.iccsafe.org. The Standard encompasses all types of residential construction, and remodeling of and additions to existing residential buildings.See http://www.homeinnovation.com/services/certification/green_certified_products for more information about product listing. Click on the image below for a copy of our certificate. © 2019 Advanced Concrete Systems, Inc. All rights reserved worldwide. Advanced Concrete Systems, Inc. is an independently owned licensee of Superior Walls of America, Ltd.